Butterfly Valves are designed and manufactured to have optimal mix of structural constancy, flow efficiency and real seating coupled with advantage of light weight, compact design and ease of operation. Only a quarter turn is needed to fully open or close the valves. The Butterfly Valves are provided with integrally molded elastomer body liner to provide perfect seating and complete isolation of body material from liquefied media to prevent it from any corrosive and abrasive impact of liquid. Available with us is a perfect array of high quality Butterfly Valves that is fabricated using high grade raw materials. Our range of Butterfly Valves includes Ball Valve, Globe Valve, Pulp Valve, Pinch Valve and Diaphragm Valves, Control Valve Supplier. These valves are resistant to high temperature conditions and is highly in demand in the market. These valves effectively regulate fluid flowing through a particular section of pipe. 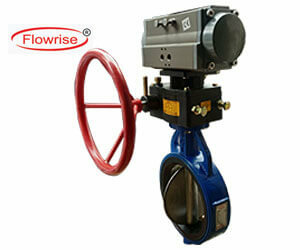 Besides, our Butterfly Valves can be availed at the most cost-effective prices. "Flowrise" lined seal valves can also be supplied with gear Unit, Pneumatic/ Electric actuator extension spindle, Chain wheel arragement etc. on request.